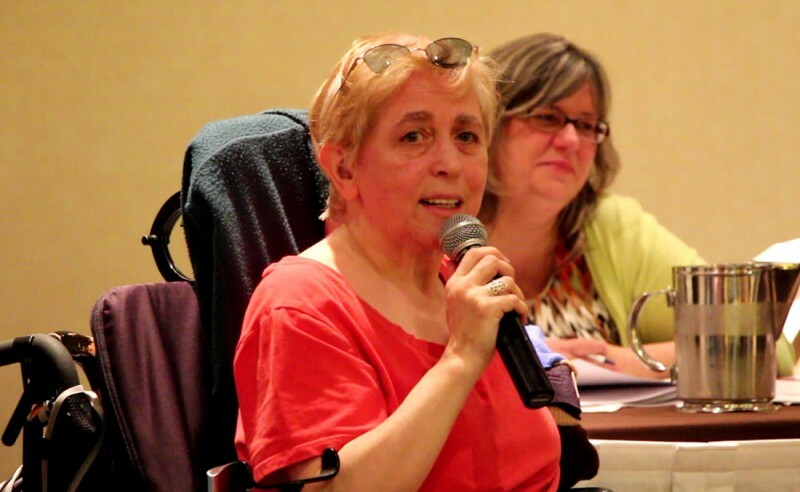 Two years ago today we lost one of our Founders and one of the most important feminist-disability activists in Canada in Maria Barile. Among the concrete changes she made were co-founding the DisAbled Women’s Network of Canada – DAWN-RAFH Canada – as well as being a co-founder of Action des femmes handicapées (Montréal) two institutions by and for women with disabilities to which she was passionately dedicated. The Standing Committee on Human Resources, Skills and Social Development and the Status of Persons with Disabilities, chose, on Tuesday, December 9, 2014, our very own Selma Kouidri, Inclusion Coordinator for Quebec here at DAWN-RAFH Canada as the recipient of the 2014 Centennial Flame Research Award. Ms. Kouidri‘s research will explore the legacy of Maria Barile – A retrospective of her rich contributions to Canadian Human Rights. Ms. Kouidri plans to document the work that Maria did in the many national, provincial and community organizations that she founded, her contributions to education, her many important articles, papers and scholarly works. All of which will be unveiled to coincide with December 3, 2015 International Day for Persons with Disabilities along with an Annual Fellowship in her name for Women with Disabilities.